From left, runner-up Paddy Crolla, league chairman David Clarke and winner Lee McAllister (picture by Bill McBurnie). The last eight of the Border Snooker League singles tournament cued up to take each other on in Selkirk last Sunday, bringing the season to an end. The final was a high-quality match between local player Paddy Crolla, of Selkirk, and defending champion Lee McAllister, of Hawick. Paddy took early control of best of seven-frame final, leading 2-0 and 3-2, before Lee took the sixth frame to take match into adecider. Quarter-finals – G. Kinnear 3, C. Cruddace 0; P. Crolla 3, D. Clark 1; L. McAllister 3, M. Riddell 0; R. Duff 3, F. Kelly 1. Semi-finals – P. Crolla 3, G. Kinnear 1; L. McAllister 3, R. Duff 0. Final – L. McAllister 4, P. Crolla 3. Pairs – D. Clark/D. Amos. Billiards – L. McAllister, Under 45s – S. Brodie. Over 45s – G. Gray. League – Hawick Burns A. Grand Trophy – Hawick Con B. 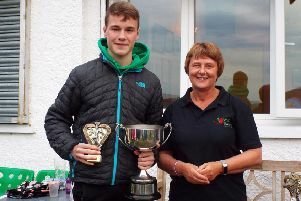 League Cup – Hawick Burns ‘A’. 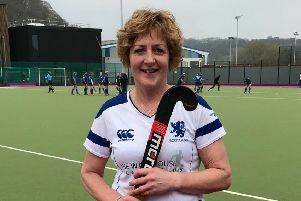 League Plate – Hawick Burns B.